Tomato soup is very easy to prepare at home. My husband's favorite and healthy soup. 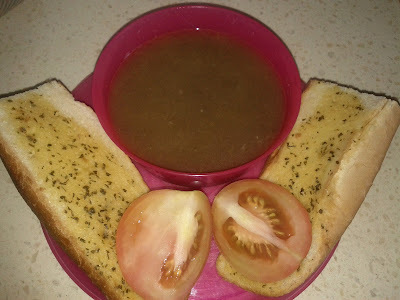 I personal never used to like tomato soup but once I prepared it at home as we both had sore throat and a cup of it made us feel much relieved. Therefore, very best soup to be consumed during cold and sore throat as this soup has lots of pepper in it. Can use 1 tbsp black pepper powder instead of pepper balls. Can add any other vegetables along with tomato, potatoes and onions like carrots. Transfer the paste in a vessel and add sufficient water if the paste is very thick and boil it. Serve hot with garlic bread or fried bread cubes.